Anyone in the consumer electronics and technology industry knows about International Consumer Electronics Show or, as it is commonly known, CES. Held by the Consumer Electronics Association, CES is an annual trade show that has been held at the Las Vegas Convention Center for over a decade. 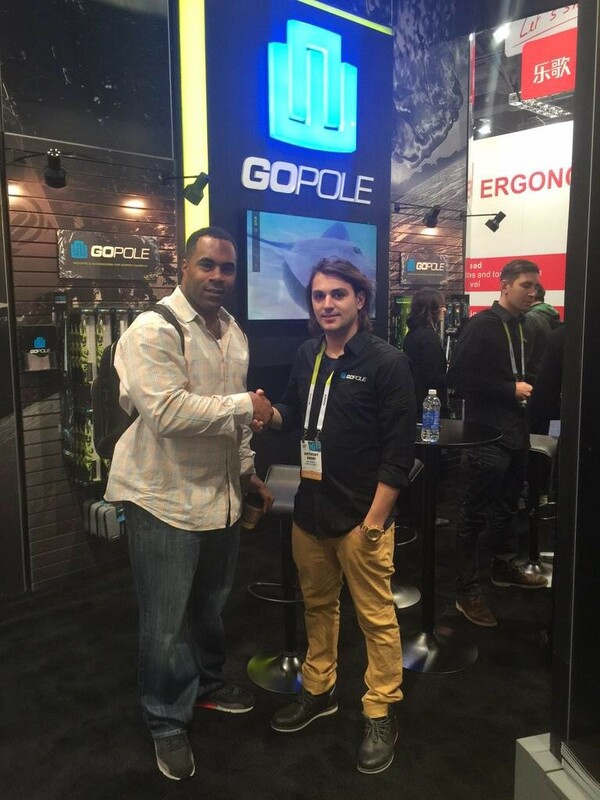 Our own, Jamal Lewis – Ex Superbowl MVP shaking hands with our client, GO POLE at the CES. The most interesting aspect of CES is that it is not open to the public. Vendors, exhibitors, appropriate businesses and individuals in the electronics and technology industry are invited to participate. Famous products such as the VCR, HDTV, Microsoft Xbox, Plasma TV, CDs, Blu-Ray Discs, and the camcorder have all been debuted at CES. Metro Exhibits has been a proud supplier of a wide range of services for exhibitors and companies who participate in CES. Metro Exhibits provides white-glove, concierge level trade show services for businesses and organizations who are involved with International CES and other trade shows, expos, and conventions. If you are an event organizer or business, Metro Exhibits provides a wide range of services that will meet any need including trade show display design, rental, sales, logistics, installation, and printing. We have 20,000 sq.ft. of manufacturing and storage capabilities throughout the country including in New York City, New York and Las Vegas, Nevada. We make sure that you never have to worry about a single aspect of your trade show experience. Las Vegas, Nevada is home to thousands of business conferences, trade shows, expos, and conventions. If there is anything that you want for your conference or trade show, Las Vegas is the city that will make sure that you get it. Most of the major hotels in Vegas have the ability to support small, mid-sized and even large corporate meetings and conventions. Las Vegas, as a city, boasts over 10,000,000 sq.ft of convention space. Metro Exhibits is intimately familiar with Las Vegas and we are proud to offer our exhibition and trade show services anywhere in the city.